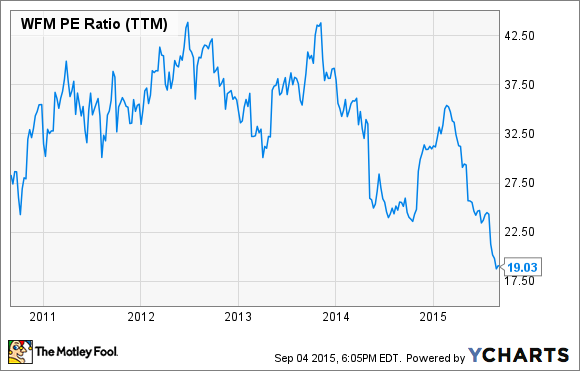 Why Long-Term Investors Should Hold Their Noses and Buy Whole Foods Market Inc. Whole Foods has had a rough start to 2015, but the stock now looks like a bargain for long-term Fools. 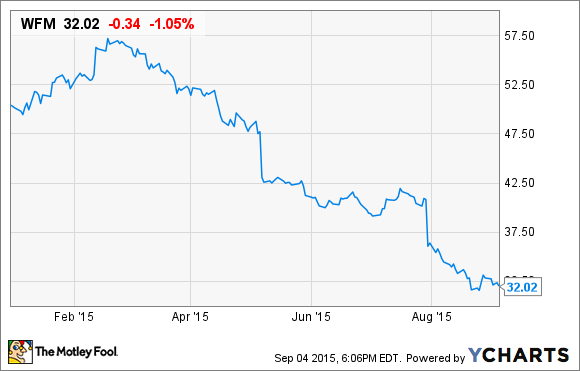 It's been a rough year for Whole Foods Market (NASDAQ:WFM), to say the least. The company has suffered numerous bruises to its public image, including the highly reported pricing scandal in New York. The negative news has dented the company's position with consumers and put it at risk of falling behind rival grocers in an intensely competitive industry. Whole Foods has missed badly on its last two quarterly earnings reports, and the stock has suffered greatly as a result. Shares of Whole Foods are down 44% from their 52-week high. But even though Whole Foods is facing some undeniable short-term challenges, its long-term future remains bright. The organics trend isn't going anywhere, and Whole Foods is still a strong brand in the industry. The stock is on sale, and long-term minded Fools should take advantage of this great buying opportunity. It's certainly true that competition in the organics space is heating up. Large supermarket chains like Kroger and Wal-Mart Stores are making big strides in organics, and they often under-cut Whole Foods on price. In fact, Kroger stated on its last quarterly conference call that its Natural Organics department grew sales by double-digits last quarter. But before investors panic, Whole Foods remains successful. Revenue increased 8% last quarter, year over year, and reached a record $3.6 billion. Earnings per share rose 4% to $0.43 per share in the same period. Over the first three quarters, sales and EPS are both up 9%, year over year. The stock has plunged at least 10% on each of its past two quarterly earnings reports, but I attribute those drops mostly to unreasonable expectations. It would be one thing if Whole Foods' revenue or earnings were in decline, but that's not the case. The company generated a 15% return on invested capital last quarter. Instead, investors seemed to have simply bid up the stock price too high going into those earnings reports. Management stated on the most recent conference call that comparable sales slowed down considerably at the end of last quarter, implying the New York City weights-and-measures audit that received national media attention took a toll. Comparable sales growth averaged just 0.4% for the last two weeks of the quarter. However, the company also noted a quick reacceleration. Management noted that comparable sales accelerated again to 0.6% through the first three weeks of the current quarter, which could imply consumers have already forgiven Whole Foods. It's important to note that the company still expects to grow down the road. For the full year, Whole Foods expects at least 7% sales growth. That's a very respectable figure and would be more than enough to generate modest earnings growth in 2015. The reason Whole Foods should continue to grow is that it's benefiting from a structural tailwind -- the boom in organic foods. Market research firm TechSci Research published a report last year that stipulates that the organic-food industry should grow at a 14% compound annual rate until 2018. As one of the country's biggest brands in the organic-food space, Whole Foods should be a direct beneficiary of this undeniable consumer trend. Whole Foods' struggles over the past year have caused the stock to sell off dramatically, which has been undoubtedly painful for its shareholders. But the flip side is that those sitting on the sidelines have the opportunity to get a high-quality company on sale. Shares of Whole Foods trade for just 19 times trailing earnings per share, which is a lower multiple than the stock market average. And that valuation represents the cheapest the stock has been in the past five years. Not only is the stock cheap, but its 1.6% dividend yield is a nice boost to the potential total returns. With time, Whole Foods should get past the public-relations nightmares from the past year and as its reputation recovers, the stock should recover as well.